Ibrahim Kibet started well but faded as Kenya lost all their opening three Davis Cup matches in Antananarivo. 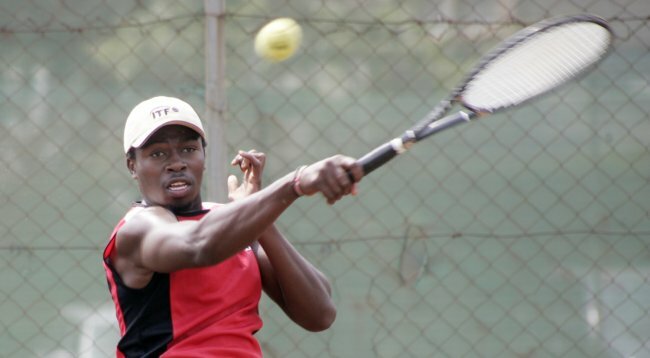 Kenya can be proud of the representation the team sent on assignment gave the nation today in their first tie of the Davis Cup Africa Zone III in Antananarivo. Despite a valiant effort however, with the last match played on the fringes of a darkening Antananarivo sky, the team came up short against strong favourites and home team, Madagascar. The day started with Kevin Cheruiyot adorned in the red of the Kenyan flag opening proceedings against Jacob Rasolondrazana. As is always his Achilles’ heel in the opening set, Cheruiyot had a slow start and surrendered the first set without a game to Kenya’s slot on the score boards. And again as is customary of him, he put up the fight of his life in the second set taking the Madagascar number two all the way. Saving a match point when a forehand slice hit the tape and crept over to go back to Deuce, the stars looked like they were aligned in Cheruiyot’s favour. If he had leveled, who knows what the result would have been. Rasolondrazana would however only need one more match point to close out the match when Cheruiyot netted to drive the drum beating crowd on Court Central at Antananarivo University into delirium and a 1-0 lead. Enter Ismael Mzai Changawa, Kenya’s number one and only hope of keeping the tie alive. Mzai faced yesterday’s player of the day and Madagascar’s number one Antso Rakotondramanga. Mzai took hold of the match and broke to win the opening set 6-4 and all was going well. The second set was a cat and mouse affair as both players played some of the best tennis on offer this week. He even stood a point away from the match, leading 6-5 in the second set tie breaker only to have a close call deny him the victory and a chance to level the tie. He’d go on to lose the set and completely fade away in the decider, going down 6-4 6-7(8) 6-1. The Kenyan team with the ever present and composed figure of George Oyoo on the captain’s chair looked to save its blushes and looked to be on the way to doing so. Despite winning the opener 6-4 and leading 3-0 with Mzai’s partner Ibrahim Kibet Yego looking to send down some missiles for a 4-0 lead, the wheels came off and the Kenyan boys lost the game and the set without winning another game. The third and deciding set would also be a 3-6 loss for Kenya to see the Malagasy beat them 4-6 6-3 6-3 and hand the hosts all the three points for a 3-0 lead. Oyoo and his charges will however pick themselves up tomorrow as they have earned the respect of the crowds here and more importantly, the other teams are keeping a close eye when the boys are playing – a mark of respect. By James Rogoi in Antananarivo.